UPDATE: We just talked with Tasha Bartholomew, Communications officer for Caltrain. She told us that the bags in question belonged to a couple who was set to board the train in Redwood City. They needed to get money from the ATM and left the bags on the platform, thinking no one would bother what they described as “bags in not very good condition.” But a man snatched the bags and took them on the train. When he realized that there was nothing of value in them, he got off the train. “It’s a bizarre story,” Bartholomew said. “Transit police responded and the train was swept just for safe measure before it proceeded on to San Jose. 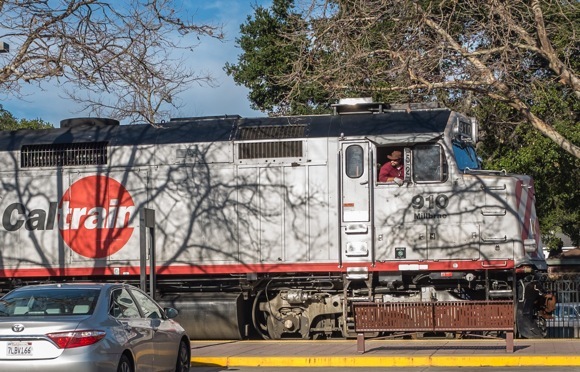 Caltrain #152, had left San Francisco at 2:07 pm, was halted in Menlo Park shortly after 3:00 pm when a suspicious suitcase was reported by at least two passengers. The train was evacuated, and police from multiple agencies responded to the scene. 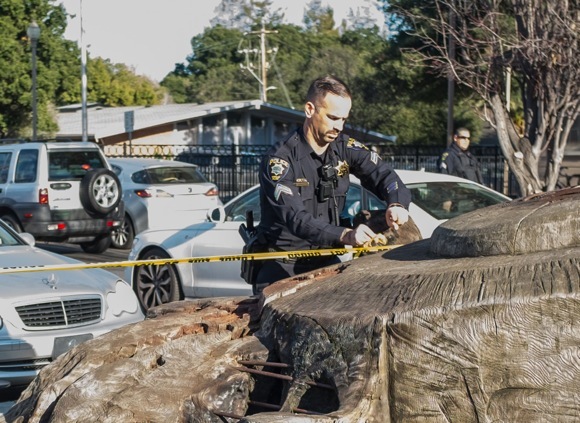 One woman told InMenlo (and authorities) that a man got on the train in Redwood City and placed a bag in the luggage rack and then got off the train. “I thought he was just going to the platform to get more bags but the door closed before he got back on,” she said.